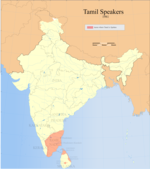 Tamil Americans (தமிழ் அமெரிக்கர்கள்) are Americans who are of Tamil ethnic origin, mostly from India and Sri Lanka and other diasporic centers such as Malaysia, Singapore, Canada and the United Kingdom. Central New Jersey is home to the largest population concentration of Tamils. Sizeable populations of Indian American Tamils have also settled in New York City, and New Jersey and New York house separate Tamil Sangams. The Washington, D.C. metropolitan area and the Research Triangle area on the East Coast as well as Silicon Valley on the West Coast also have Tamil associations. The Tamil community in the United States is largely bilingual. Tamil is taught in weekly classes in many Hindu temples and by associations such as the American Tamil Academy in South Brunswick, Tamil Jersey School in Jersey City, New Jersey, and the International Tamil Academy. The Tamil community is largely connected to the Hindu community, along with other groups from South India. In most Hindu temples in the United States, the prayers are in Sanskrit. However, in North Brunswick, New Jersey, the "Tamil Temple" ("Tamil Annai Thirukkoyil") conducts all the prayers in the Tamil language. The Hindu Temple in Houston, Texas, is dedicated to Meenakshi, a manifestation of the goddess Parvati. There is also an active Christian minority. ^ "Commuting Times, Median Rents and Language other than English Use in the Home on the Rise". December 7, 2017. Retrieved December 12, 2017. ^ "ABOUT FETNA". Federation of Tamil Sangams of North America. Archived from the original on 2013-01-16. Retrieved 2013-04-01. ^ "Yearbook of Immigration Statistics: 2012 Supplemental Table 2". U.S. Department of Homeland Security. Retrieved 2013-03-31. ^ "Yearbook of Immigration Statistics: 2011 Supplemental Table 2". U.S. Department of Homeland Security. Retrieved 2013-03-31. ^ "Yearbook of Immigration Statistics: 2010 Supplemental Table 2". U.S. Department of Homeland Security. Retrieved 2013-03-31. ^ Kirk Semple (2013-06-08). "Sri Lankans have gathered on Staten Island,..." The New York Times. Retrieved 2013-06-09. 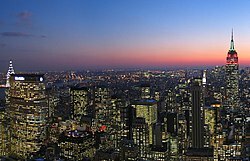 ^ "Why Staten Island?". Little Sri Lanka. Retrieved 2015-07-25. ^ Holy Haber (December 2016). "D-FW donors give biggest contribution to Harvard chair in Tamil literature". Retrieved December 13, 2018. ^ Narayanan, "Tamils," p. 877. Fuller, C. J. & Haripriya Narasimhan (2014). Tamil Brahmans: The Making of a Middle-Class Caste. University of Chicago Press. Underwood, Kelsey Clark (1986). Negotiating Tamil Identity in India and the United States. PhD thesis, University of California, Berkeley. This page was last edited on 5 April 2019, at 08:52 (UTC).